This dish has only a few ingredients, but their complimentary flavours ensure this meal is extremely tasty. Sea bass fillets, grilled to perfection, add a comforting element to this healthy salad. Preheat the oven to 200oC, gas mark 6. Cook the rice in boiling water for 10 minutes, add the lentils and cook for a further 15 minutes until tender, drain and rinse. Meanwhile, roast the tomatoes and onion in 1 tbsp oil for 15 minutes. Whisk together the remaining oil and white wine vinegar and stir into the rice along with the tomatoes and chives. Season to taste and cover with foil to keep warm while cooking the fish. 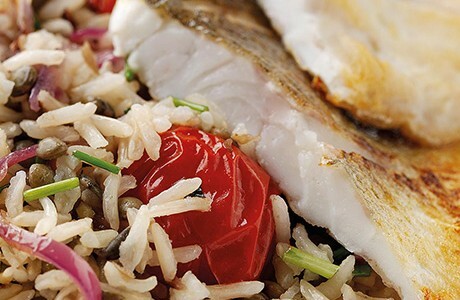 Place the sea bass fillets under a preheated grill for 7-8 minutes until cooked and serve with the rice salad.